The promise of a new year always stirs my desire for reflection & change, so with that in mind I've decided it's time to bring back an old favourite. It's always good to focus on the positive things, no matter how small or insignificant they seem. After all, very often the little things mean the most. 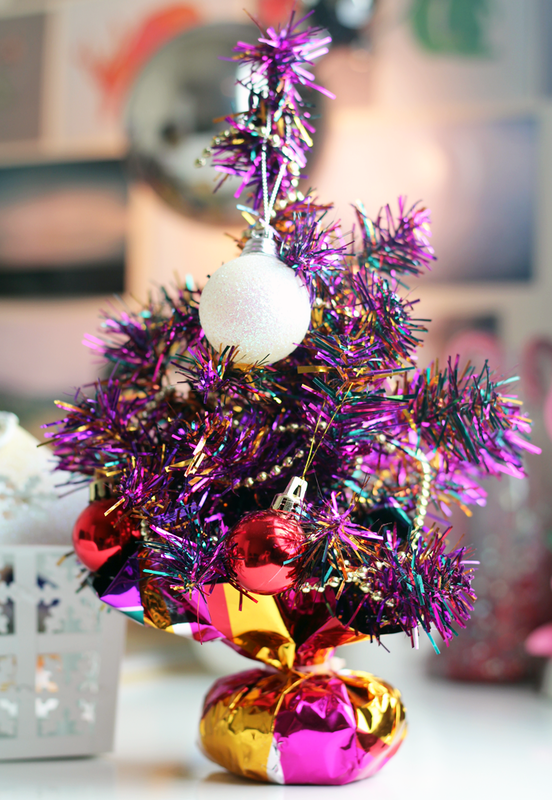 Rediscovering my mini Christmas tree in our decoration box. I got it a couple of years ago for just a few pence. It's pretty over the top, but it's so tiny and adds a little bit of festive cheer to my desk. Watching the Harry Potter films throughout December - it's The Chamber of Secrets tomorrow. afternoon #FollowTheSpiders?! Yankee Candle Candy Cane Lane - I'm already half way through my second little jar and definitely regretting not getting the big jar! I've been burning it constantly at my desk and loving every second. Chocolate digestive biscuits. They're my new weakness and I think I'm going to have to stop buying them! I had to buy a new little bookcase this week because my others are very full. I regret absolutely nothing about this situation! Laura Laments | Laura is wonderful and her blog is so relatable & always guaranteed to make me smile. Sophie's Makeup Blog | Sophie's blog is the first I click over to when I'm in need of a daily dose of beauty! Deluminators | Jane shares her fabulous style & snippets of her life in Australia. And she's lovely as well! Jenny Purr | Jenny is a very wise young lady & she always gives such incredible, positive advice. In Her Good Books | A brand new book blog written by Sophie that I'm already so excited about! Haha that's such a cute tiny Christmas tree! And I have a MAJOR weakness for choc digestive biscuits. I feel the same about Harry Potter but I re-read the books. 3 down 4 to go! I just followed deluminators, it sounds like my kind of blog! :) I hope to watch all the HP films again this Xmas - if I can find the time! I also have a Christmassy scented candle that I've been saving as it was a gift last year and very expensive, I think this week I'm going to be brave and light it! I definitely am due for another watch through all of the Harry Potter movies! I tend to do it at this time of year as well, since I have more free time. Thank you so much for including me, Jennie! That little Christmas tree is adorable - nothing better than adding a little bit of festive cheer when the weather's as awful as it is right now! There is nothing better than watching Harry Potter films over the festive season! This is such a lovely post! I'm going to check out those blogs :) I also can't wait for Harry Potter on TV! Thank you so much for including me Jennie! Candy Cane Lane is one of my all time favourite Yankees! I know it's new for this year but it is just SO good. I will be certainly picking up the large jar in January, maybe even two! I may check out the blogs you have included. Thank you for the new blog links I have some reading to do. That little tree is just wonderful! I got so excited when I found HP on last Saturday although my OH doesn't like watching them on TV when we have the boxset and we can miss the adverts but it's not the same! Still need to read the books! Chocolate digestives are my weakness! There really the only biscuits I eat but I only eat 3 a day, trying to lower my wheat/gluten intake but they are so worth sore tummy's so I feel you! That tree is so cute! I am with you on the chocolate digestives, sometimes it's too hard to resist! I'm all about the neutrals when it comes to Christmas decorations but LOVE that little Christmas tree! Always enjoyed these posts from you - little snippets of your life.